Where can I buy Filorga Art Filler Fine Lines? You can buy Filorga Art Filler Fine Lines from us. Order Online on our website or by telephone. Speak to a customer service representative if you have any questions or concerns about your order. We also provide free shipping for orders over $250 or mor, so stock up for your cosmetic practice today! What does Filorga Art Filler Fine Lines come with? When you purchase Filorga Art Filler Fine Lines, you will receive 2 prefilled 1ml syringes that. 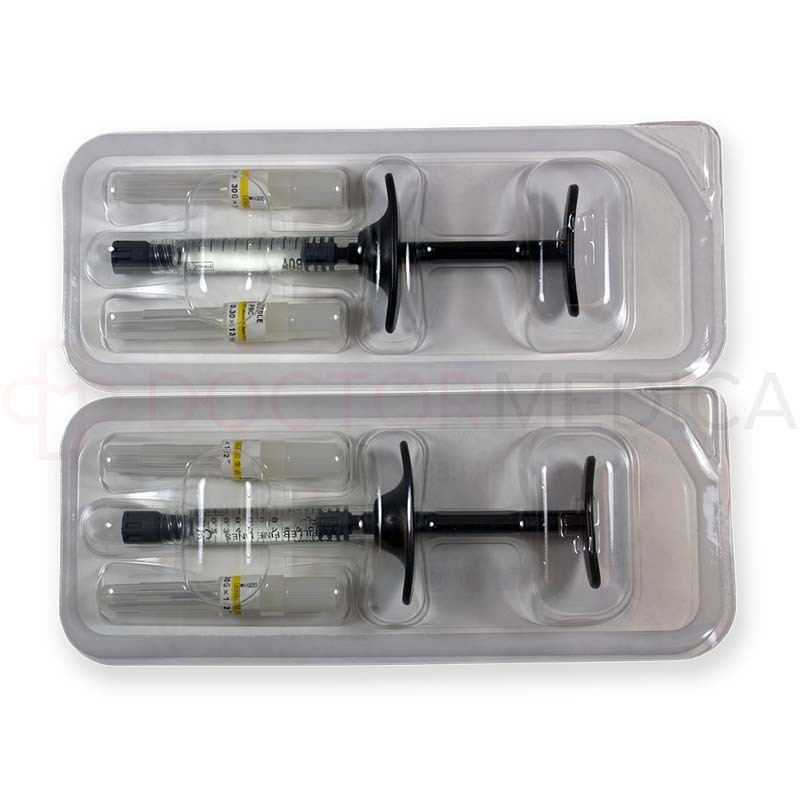 This aesthetic injectable also comes with 4-30G1/2” needles, a packaging insert, and 4 traceability labels. What are the benefits of Filorga Art Filler Fine Lines? 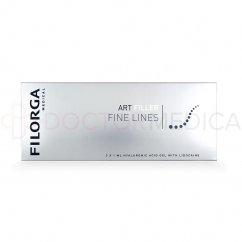 Filorga Art Filler Fine Lines is recommended for fine and superficial wrinkle filling. Its hyaluronic acid, created with Tri-Hyal Technology, supports the skin’s ability to hold in moisture while adding volume to areas affected by ageing. This dermal filler is designed to smooth out the look of aged, wrinkly skin, granting your patients with a youthful appearance. What is Filorga Art Filler Fine Lines made of? 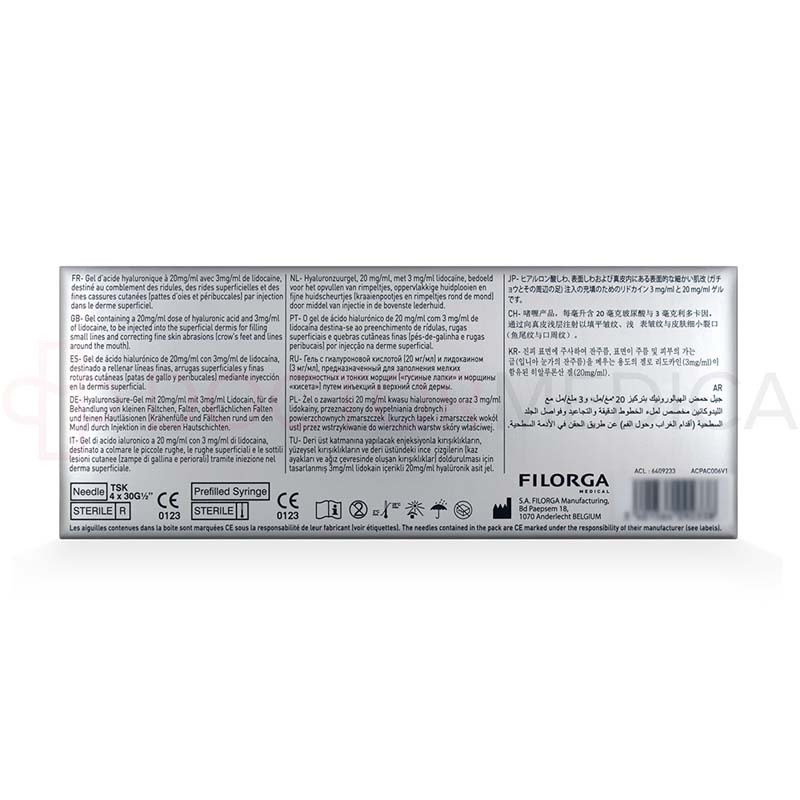 Filorga Art Filler Fine Lines is made of hyaluronic acid created using Tri-Hyal Technology. 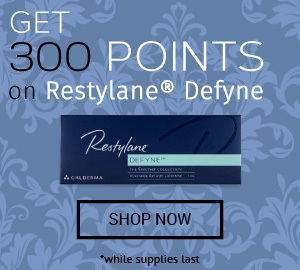 This unique filler has several properties, including sculpting, volumizing, and smoothing abilities, which work to instantly enhance the look of your patient’s skin. This particular hyaluronic acid filler offers a number of benefits, including excellent hydration of the skin, protection and conservation of active principles, and a safe delivery of vital ingredients distributed into the deepest layers of the skin. Filorga Art Filler Fine Lines is formulated to evenly smooth out the skin for a softer and much younger-looking complexion. How do I use Filorga Art Filler Fine Lines? When you receive Filorga Art Filler Fine Lines, store it in a temperature-controlled room between 2° C and 25° C, away from sunlight. After consulting with your patient about the area of treatment, discuss whether or not a numbing agent will be applied over the site of the injection with your patient. Then, inject the solution into the superficial dermis using a sterile needle. Results will immediately take effect. Similar to other cosmetic injectable treatments, treatment with Filorga Art Filler Fine Lines can 30 minutes or less to complete, depending on the area of the injection, your patient’s skin type, and his or her requirements. This injectable solution is ideally suited for patients who are experiencing the very early signs of aging. When subtle wrinkles around your patient’s eyes begin to appear and perioral lines start to manifest, recommend Filorga Art Filler Fine Lines to help slow down the aging process by eliminating superficial lines and wrinkles. This filler can also be used to combat sagging skin through volume restoration. What areas should I use Filorga Art Filler Fine Lines on? Filorga Art Filler Fine Lines can be used to fill in wrinkles and skin folds of the superficial dermis, specifically fine lines around the eyes (crow’s feet) and unwanted perioral lines. The results of Filorga Art Filler Fine Lines treatments may vary depending on the age of the patient, his or her lifestyle, and the area of correction. Consult with your patient about the desired look of his or her skin to develop an appropriate treatment plan to meet their needs and expectations. Why should I use Filorga Art Filler Fine Lines? 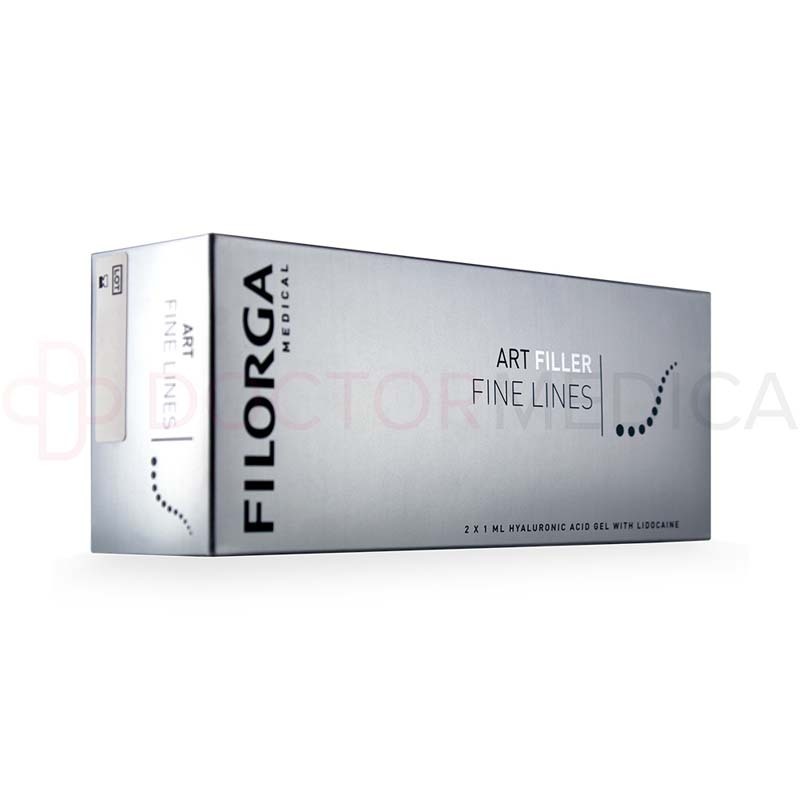 Filorga Art Filler Fine Lines is a fine and superficial wrinkle-filling agent that trained medical professionals use to improve the overall quality of their patient’s skin. Suitable for all skin types, this aesthetic injectable provides natural-looking skin that appears fresh, radiant, and full of volume immediately following the injection. 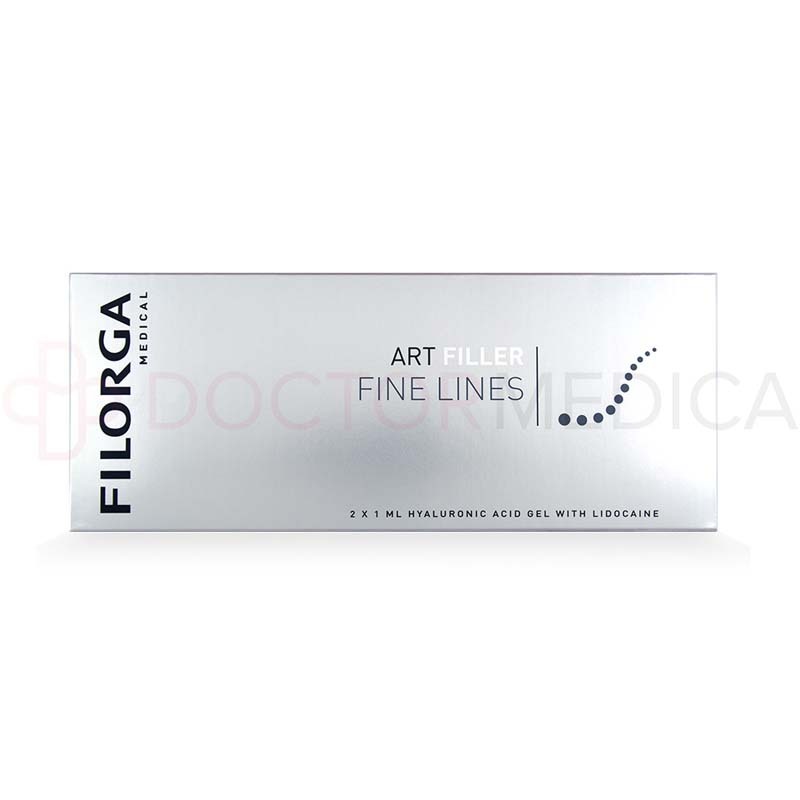 To give your patients a treatment that they will return for more of, order Filorga Art Filler Fine Lines from Doctor Medica today. Contact one of our customer service representatives by phone, or email us at info@doctormedica.co to set up your account and place an order. Who is Filorga Art Filler Fine Lines intended for? Filorga Art Filler Fine Lines is intended for patients who are noticing the physical signs of aging at an early stage. When your patients want a natural method of wrinkle-correction, administer Filorga Art Filler Fine Lines treatments to grant them a hydrated, wrinkle-free complexion. Your patients may experience side effects following the injection process. However, these side effects are minor, and typically last up to 1 week or less. Common side effects include redness, swelling, and discomfort at the site of the injection. For a full list of side effects, precautions, and contraindications, refer to the product leaflet.